During this past year, by far the most surreal in modern political history, the performance of the AARP has been beyond weird. The non-profit organization, which the Keyster and most others presume stands for American Association of Retired Persons, has been, well, stridently fighting against seniors. Was this the work of Rod Serling of Twilight Zone? Had Federico Fellini stuck around to film one final fantasy? 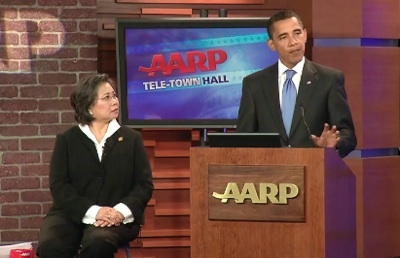 AARP executives were among the first to back President Obama’s plans to nationalize the best health care system in the world… a process that the Prez proposes to largely finance by slashing health care for seniors. Even after it became clear that the Dems also planned federal panels to determine if people had enough use to society to qualify for medical care, AARP steadfastly stood with Harry’s and Nancy’s infamous “death panels” over seniors. When the Keyster reached a certain age — I think it was about 35 — he began receiving direct-mail ads from AARP imploring him to join the organization. When Mrs. Keyster also reached the magic number, our AARP mailings doubled, some days a veritable phone book of pleas to buy memberships and sign up for various insurance programs. And just think of the discounts we could get on hotels, rentals cars and shuffleboard sticks! As I put the AARP materials in the recycling bin, I naively imagined AARP to be a special-interest group that relentlessly lobbied for ever-growing pile of government hand-outs for seniors. So why would the American Association of Retired Persons join with Barry to destroy health care, especially as it would apply to older people? And then it hit me like a final-lap bump draft from Jeff Gordon: I was completely wrong about the meaning of the AARP acronym. Using his experience as an investigative journalist, the Keyster went to work on this mystery. American Association of Radical Progressives: This explains why AARP gleefully backs anything the Dems throw out there, as long as it involves higher taxes, more government and less freedom. And finally, An Avalanche of Recycled Postmail: Could this be the true meaning of AARP at last? An organization that exists simply to exploit bulk-mailing rates and make money off of printing? This entry was posted on February 3, 2010 at 10:42 am and is filed under Uncategorized. You can follow any responses to this entry through the RSS 2.0 feed. You can leave a response, or trackback from your own site.